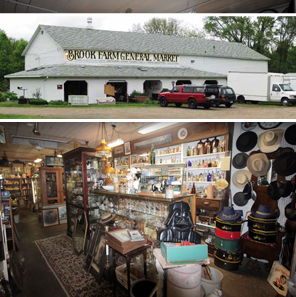 Brook Farm General Market specializes in buying and selling quality used items, mainly solid wood furniture, antiques and collectibles. Available for concerts, barn dances, weddings, wakes, or any event where traditional American music is appreciated. In the barn you will find two floors full of interesting and useful items. You can expect to see a vast array of antique, collectible and contemporary used furniture to complement any and every room in your home or business. Whether your favorite style is Mid Century, Victorian, Country French, Arts and Crafts, Modern, or Empire, you name it and we may have it. The answering machine gives our current hours so you can call any time. Friday: 11:30 a.m. - 5 p.m.
© 2016 Brook Farm General Market All Rights Reserved.